The International Astronautical Federation is an international space advocacy organisation based in Paris, and founded in 1951 as a non-governmental organization. It has 246 members from 58 countries across the world. They are drawn from space agencies, industry, professional associations, government organizations and learned societies. It is linked with the International Academy of Astronautics (IAA) and the International Institute of Space Law (IISL) with whom the IAF organises the annual International Astronautical Congress (IAC). Its flag is white with its logo placed in the center of the flag. Name of the organization is written under the logo in black letters. Logo is a blue disc with white letters of acronym, displaying five stars and a comet. Around the disc, IAF motto is written: "Astronautica ad pacem hominumque progressum" (Astronautics to peace and human development). 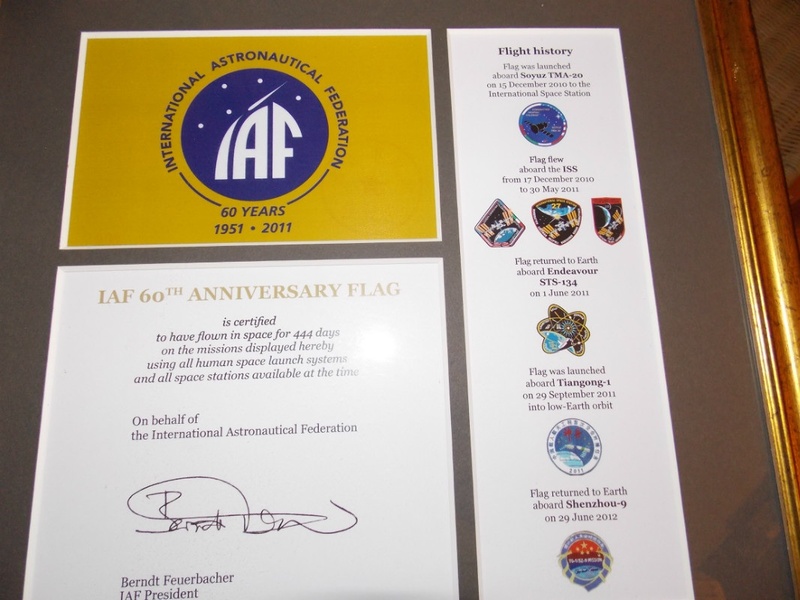 In 2011, to mark its 60th anniversary and celebrate its global community and reach, the IAF decided to create an anniversary flag and to send 300 IAF flags into a space journey. This flag has golden filed with a modified version of its logo. There is name of IAF placed around the blue disc, and years marking the anniversary is written under the logo.